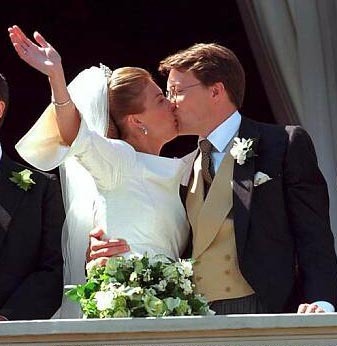 Prince Constantijn and Princess Laurentien celebrate their wedding anniversary this week. 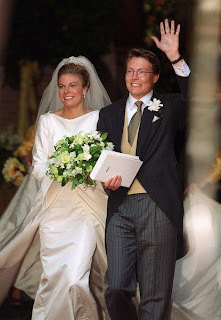 Ten years and three children later, we're taking a look back at Laurentien's wedding attire. 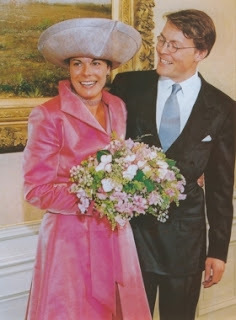 Laurentien's father was a government minister who served Constantijn's mother Queen Beatrix and her mother before her, and Laurentien's mother was a school friend of Beatrix's, meaning these two had known each other for a long time before their engagement. 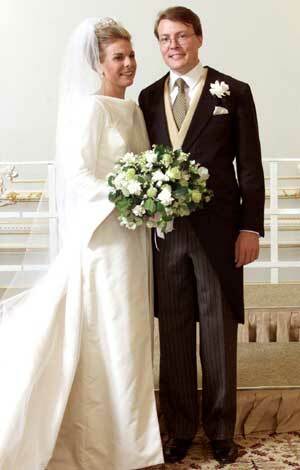 They celebrated their union with three days of ceremony and festivity, beginning with the civil ceremony on 17 May. For this, and throughout, Laurentien was dressed by Edouard Vermeulen of the NATAN fashion house. Her pinkish peach coat and dress were topped with a statement hat and accessorized with a sparkly choker and matching bracelet. On the 18th, a gala dinner and dance was held for the couple and their royal guests. 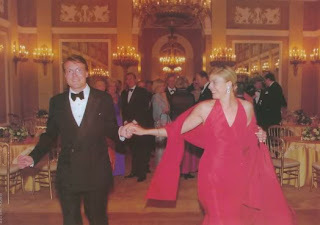 Laurentien chose a red halter neck gown. Finally, on the 19th, the religious ceremony was held. The dress has a coat look, with a split for the train and a more slender skirt underneath, making for a rather dramatic walking effect. The high boat neck rolls to a deep "v" shape at the back of the dress, though the effect is somewhat hidden by the thick layers of the bride's veil. 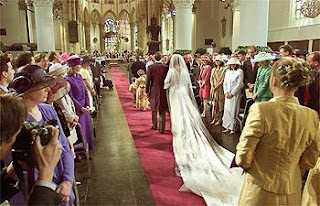 Those layers of veil covered a train nearly 12 feet long, more than 3.5 meters. A challenge for her bridesmaids to be sure. Another statement feature on display: the bell sleeves, particularly evident with all the waving that takes place on a day like this. This dress may not be the most memorable of all time, but I think it's quite triumphant. It's a dress made of elements that each carry a touch of drama on their own, but are brought together for a simple end result by the lack of ornamentation on the gown as a whole. When waving, the sleeves are on their own for show. When walking, from the front the split skirt detail takes the show, and the back and train add interest from the back. There's always something to look at, but never too much. 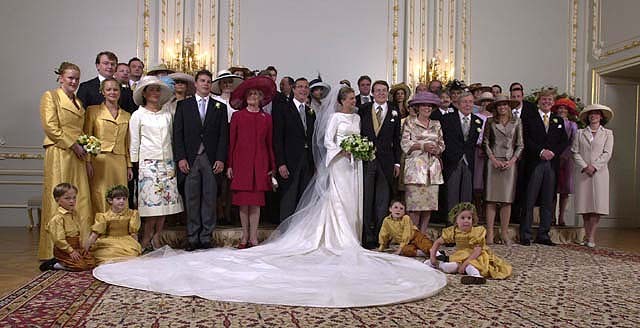 Once again, I marvel at how NATAN can do so well with wedding gowns (see also: Mathilde and Claire), and yet dress these ladies so disappointingly for the rest of their lives. Laurentien wore the diamond Laurel Wreath Tiara. 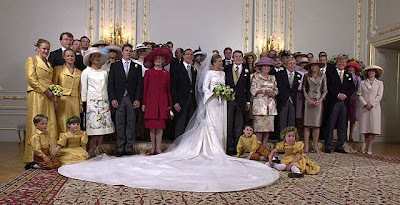 It was worn by Queen Beatrix in her younger days, and has also been borrowed by Princess Margriet, but it really isn't worn that often. You can see a clearer view of it here. 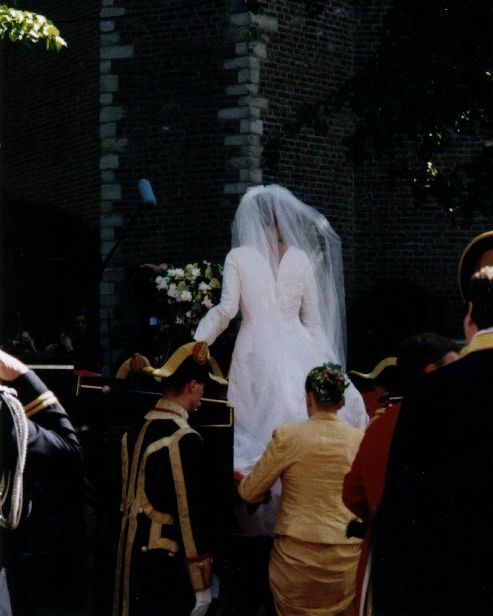 It's quite a bit larger than it looks with the veil all around it, I think. Are you a fan of Laurentien's gown?